Download, Play and Convert Music With Audials One - A Definitive Guide! I guess you all are aware with this amazing tool right. 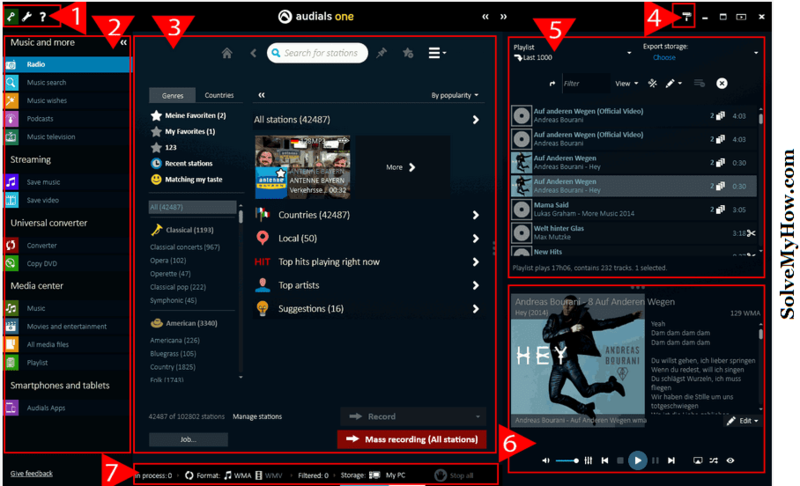 Audials one is a smooth way to download or convert music and videos for free. Name the song and search it in Audials one, I guaranteed you, You will find it in the next second with Audials one. It has the great database of songs. Not only this you can play radio, record, convert or edit songs with just clicks of buttons. You can manage your collection of playlist easily with this tool. Name something that's even distantly related to Online music, music streaming or anything and Audials will get the job done for you. Don't you found this tool interesting ? If yes, then keep reading because I'm going to introduce you its amazing features and overview. In this section we will see the overview of this tool. We will see the UI and its working. Below mentioned is the snap shot of (Audials one 2016). The look and feel may get differ with the version you install but the basic structure will remain same. You can see the above image. The UI is totally divided into 7 parts and we will see them one by one. So lets start with the first one. Sign in with audials. After that customize it according to your needs. You can change the option setting for that and you can give new look and feel to it. You can keep the things according to your need. Help is basically for you support. Do you have any question ? No worries just click on "help" button and shoot your questions. You will get the help from audials expert. Audials one's navigation panel is by default divided into 4 sub parts. These are the main categories and they are further more divided. In navigation, your programs/features are grouped. I know the list is pretty huge but this is what audials got the rich features. The 3rd screen you are seeing in the main image is feature view of this tool. You can see this tool has got the rich view. I'm sure they hire a greater programmer for this as this look won't be possible right ! Colors are the most important part of UI and look and feel. So in audials you can change the colors and font size from the drop down menu according to your needs. The next and the most important part of this tool is playlist. As you can see in the picture. Huge playlist is being played. You can create, delete and edit your playlist easily. Audials players is one of its plus point. Just look at its look and feel. You can play, next, rewind etc can do all the tasks very easily and only at the mouse click. Status line will be shown at the bottom of this tool. Status line represents the ongoing recordings. You can change the output setting anytime. So this was the overview of audials one. I hope you found this helpful and worth reading. Now let us look at the cool features provided by this tool. What audials one can do for you ? With audials one you can record, convert, edit, manage music and videos. Radio : Audials radio feature is one of the top feature it has got. You can play or record your favorite radio station from all over the world. Not only this, you can record music by genre, country or artist. Search for Music and Videos : You can search for music and videos and easily download them. Music Wishes : Fill you playlist/wishlist with songs, albums and artist and audials will fulfill you requirement by downloading them form the best internet radio stations. Televisions : Find, record or download your favorite TV shows with audials easily. Audials allows you to convert your media files to other formats. This makes file to be playable in all devices. This is the best features of this tool. You can convert you files into MP3, AAC, WMA etc. Not only this you can also record and burn DVD. Audials allows you to edit you recording and downloaded files. This is so easy that you can do it by yourself even without reading the help sections. The main feature in editing recordings are it allows you to add tags and also allows you to edit it. With audials you can manage your recorded as well as downloaded media. You can play your media files. Not only this you can copy and burn media files to another device. You can read more about audials features at there official site. So above we saw the overview and features of audials. Now let see how to download and install it on your computer. Before downloading audials just make sure, your PC is up to date. This is the per-requisites of this tools. Please check windows update - to keep your pc up to date. Now lets see how to download and install them. Step 1 : Visit Audials homepage and download audials. Step 2 : Open you download folder and double click the "Audials_One-Setup.exe" setup file. This will launch the installation. Step 3 : Select standard installation and click on Install. This will take couple of minutes. So kindly have patience. Note : When you download it for free by visiting the above link. You will only get a demo version. But you can buy it anytime and make it pro version. You can buy Audials One 2016 for $49.90 only and you can buy Audials Gold Subscription for $39.90. Buy Now - Limited Offer ! After you bought you license key you have to enter it in the tool to make it pro version. So lets see how to do that. This is pretty easy. You just have to check you mail for that. When you pay for this tool, you will get one license key in your mail. Find it out and just copy it. After that open Audials One. Step 1 : Open Setting >> General. Step 2 : Click license key. Step 3 :- Enter/paste your license key and click on activate. So this was the definitive guide on Audials One. It the best tool for entertainment which let you access your entertainment stuff from anywhere in the world. What are you waiting for ? Go give it a try today and grab the huge discount. Go to the developer’s Website to download the free version or buy the full version of Audials One 2016. Do let me know if you have any questions regarding this tool in the comments below. I would love to answer your queries. You can also subscribe for SolveMyHow newsletter to get instant updates about Tech, SEO and make money online tutorials right into your inbox !